You'd never know it from their uniforms, but the Sounds were the affiliate of the Cincinnati Reds. The Reds have such distinct uniforms, some of the best in baseball, and their color scheme is pretty obvious - RED. So it's disappointing to see their minor league team wearing generic blue uniforms, looking like the Texas Rangers or something. Doug "Eyecharts" Gwosdz - last played in the majors in 1984, and last seen on a major league card that year, but still bouncing around the minor leagues five years later. The Louisville Redbirds were the Cardinals' AAA team. If Jim Puzey had made the major leagues his cards would have become as popular as those of Rusty Kuntz and Pete LaCock. Best known as a Cub, Leon Durham started and ended his career with the Cardinals. You last saw Roger Erickson on a major league card in 1984. You last saw him pitch in the majors in 1983. Yet here he is, five years later, in his last unsuccessful comeback attempt. Despite their name, this team was an Expos, not an Indians, affiliate. At least their uniform looks like the Expos. Tom Akins used to produce the Indians' baseball card sets. There is some nice photography in this set, with some varied backgrounds, and thanks to names on the backs of the uniforms, you can identify lurkers, like pitcher Scott Anderson on Tim Barrett's card. The biggest star in the set is future Rockies star Larry Walker. Pitcher Madison Younginer was Boston's seventh round draft pick in 2009. In 2012, he pitched for three Red Sox minor league teams - GCL Red Sox, Lowell and Greenville. He kindly answered my questions about baseball cards. "My first card made was done by Tristar. That one was special being my first, but more importantly because it pictured me hitting in a pre-draft tournament. As a pitcher that's something most card enthusiasts always mention when asking me to sign. When I was a kid I collected thousands of baseball cards. I always had a box in my stocking Christmas morning. One of the coolest things was our local store would give us a pack of cards if we had all "A's" on our report card. I'll never forget walking in there and proudly handing over my report card to the store clerk. Baseball cards have a big impact on the fan side of the sport. I always try to sign when we have time because I know that as a little kid it would make my day. Baseball wouldn't be the same without them." Thanks! I don't have the Tristar card, but here is one I do have from Topps Pro Debut. This is one of the most interesting teams in the set. It even has a team picture card, though it seems to have been taken from really far away. Two teenage clubhouse managers. Drake and Barden were there last names - these days, those would probably be common first names. It looked like Mark Eichhorn was a flash-in-the-pan with Toronto who was on the way down, but he reversed that situation and returned to the majors for several years with the Angels. Jim Beauchamp got to manage his son Kash on this team. The biggest star on the club, future Yankee hero David Justice. Here's a card of a guy named Alex Smith. Did you know that Colin Kaepernick was drafted by the Cubs in 2009? Here's a guy named Eddie Mathews. I guess the Braves figured, "it worked once..."
Remember when people were talking about Leo Mazzone as a Hall-of-Fame pitching coach? Then he went to the Orioles and had no success. Guess it was the pitchers, not the coach. First baseman Pete O'Brien played twelve seasons in the major leagues for the Rangers, Indians and Mariners, hitting 169 career home runs. His best season was 1986, when he finished 17th in the AL MVP voting, hitting .290 with 23 HR and 90 RBI. Now the owner of the AtPeace Flotation Spa in Colleyville, TX, he kindly shared this baseball card story. "My favorite was probably the one where the bat was completely sawed in half by a pitch. My teammates mentioned that it looked like I was running a relay race with the baton in my hand." Troy Neel played for the Oakland A's from 1992 to 1994, finishing seventh in the Rookie-of-the-Year voting in 1993 after hitting .290 with 19 HR and 63 RBI. After his US career, he played six seasons in Japan and one in Korea. Now the President of the Port Vila Game Fishing Club in Vanuatu, he kindly answered my questions about baseball cards. "There were some cards of me that I preferred over other ones but I couldn't tell you which ones without having them in front of me. There were so many card companies then and so many cards. I did collect cards way back in the day when I was young but when I went off to college Mom cleaned out my room and threw them out. I remember having some really good ones from my brothers who were a lot older then me as well as the ones I collected from the 60's and 70's." Chase Whitley was the Yankees' fifteenth-round pick in 2010, and has risen quickly through their system. In 2012, at AAA Scranton Wilkes Barre, he was 9-5 with a 3.25 ERA. He kindly answered my questions about baseball cards. "I used to collect cards when I was really little mostly Atlanta Braves cards. I would say my favorite was any Chipper Jones card." Outfielder Max Walla was the Brewers' second round draft pick in 2009. In 2012, at Class-A Wisconsin, he hit .234 with 7 HR, 41 RBI and 12 SB. He kindly answered my questions about baseball cards. "When I was about 5 or 6 years old, I went to spring training in Tucson, to watch the White Sox play. Frank Thomas was and is my favorite player. I went to get him to go sign my jersey before the game and he did it. When he did I gave him one of my t-ball cards. Any guy would have been like what on earth is this little kid doing. But without missing a beat he goes, "Thanks buddy!!" He gave me a big smile and put it in his back pocket and kept going down the line signing autographs. Now he probably threw it in the trash when he walked back into the dugout and got a good laugh out of it with the guys on his team haha but it absolutely made my day. He was awesome. And it was a wonderful gesture. Physical talent and skills aside, that's why he will always be my favorite player. It was just so cool. 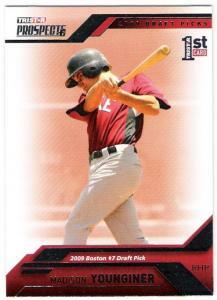 To answer your other question, no I don't really collect cards, but my favorite that I have is a Dustin Pedroia Upper Deck card. Great ballplayer and attitude." 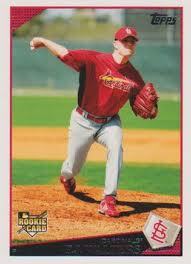 PJ Walters has pitched in the major leagues since 2009 for the Cardinals, Blue Jays, and, in 2012, the Minnesota Twins. He kindly answered my questions about baseball cards. "I'd have to say my favorite would have to be my first big league card. That's something you dream of as a kid. I wouldn't say I collect cards but I have a few at home." Thanks! 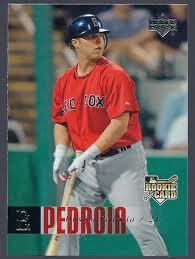 I don't have that card, but here is one I do have from his minor league days. Outfielder Scott Khoury played five seasons in the Orioles and Indians organizations, hitting .252 with 64 HR and 267 RBI. Now the owner of Captain Khoury's Ultimate Sport Fishing in Connecticut, he kindly answered my questions about baseball cards. "I am not a card collector, but my favorite card was my 1988 Waterloo card. I grabbed a bag of Red Man, put a big chew in, threw 3 or 4 bats over my shoulder and had the photo taken! Although I never made the big leagues, I had the opportunity to play in Amsterdam, Holland for 3 years, where I had a great time and eventually met my wife. You never know where baseball will take you!" Thanks! I don't have that card, but here is one I do have from 1989 Canton-Akron. The Syracuse Chiefs were the Toronto Blue Jays' AAA team. Here Juan Guzman practices his growling face that we would use on so many major league cards. 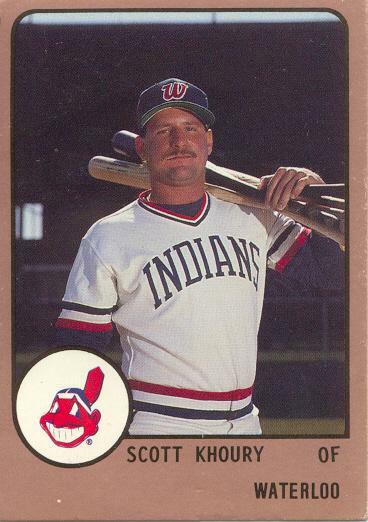 Mark Ross spent parts of six seasons in the majors for three different teams (including the Blue Jays in 1988) but never got a major league card. The son of former Cardinals and Pirates star Andy Van Slyke, Scott Van Slyke made his major league debut this past May, and delivered some key pinch hits for the Dodgers. He kindly answered my questions about baseball cards. "I do not collect any cards, never had. My older brother collected cards when we were younger. His favorite card was the Griffey rookie card. He collected enough cards to fill 4 shoeboxes full of them. Obviously I enjoy a lot of my father's cards though!" One of the great baseball team names, the Mud Hens have been the Tigers' AAA team since 1987. Delwyn Young is the father of Nationals' infielder Delwyn Young Jr. He is not related to Delmon Young or Dmitri Young. I like getting cards of people like Larry See, who had a brief major league career but never got a major league card. ...but it's even more unusual when it features his height and weight! At 6'4", 205, he was bigger than most of the players on the team. The Clippers were the Yankees' AAA club, even though they wore hats that looked like those of the Chicago Cubs (or Calgary Cannons). This cards features manager Bucky Dent standing in the middle, flanked by coaches Ken Rowe and Champ Summers. Rowe and Summers died about six weeks apart this past fall (Summers in October, Rowe in November). Like his mentor Billy Martin, Bucky Dent always wore a cross on his baseball cap. You can often see it on both Dent and Martin's big league manager cards. 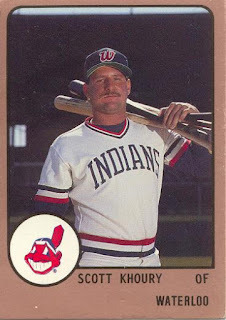 Ken Schnacke was named GM in 1989, which is probably why he has a card even though his title is still listed as "Asst. GM" on the card. He is still the Clippers' GM today. In 1989 the Scranton Wilkes Barre Red Barons were the Phillies AAA team. In 2013, the Scranton Wilkes Barre Rail Riders are the Yankees AAA team. I was going to make a joke about Kevin Bootay, but Scott Crawford beat me to it. I will just note that he played over 500 games in the major leagues. For the last fourteen years he has been a scout, currently with the Chicago White Sox organization. There was a John Martin who pitched in the major leagues for the Cardinals in the 1980s. This isn't him, but this John Martin did pitch in the Cardinals organization at the same time as the other John Martin, though they were never teammates.